BRUNEI Gas Carriers (BGC) welcomed the arrival of the newest addition to its fleet – the AMANI, with a thanksgiving prayer ceremony yesterday. The AMANI is the fourth LNG carrier in the BGC fleet and was built by Hyundai Heavy Industries in Korea over a period of 19 months. Measuring in at a size of 154,800 m3, with a length of 288.33 metres, it is the BGC’s largest ship. 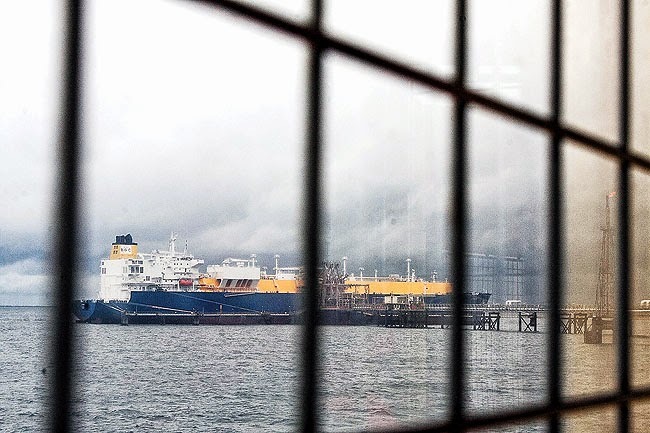 Getting onto the ship requires taking a cable train ride from the Brunei LNG plant, which yesterday carried a delegation of BGC and Brunei LNG staff there above the sea. The delegation, led by BGC’s Managing Director Haji Shabudin bin Haji Musa, was welcomed upon arrival by the AMANI’s Captain, Abdul Mateen Abdurrahman Liew @ Martin, before heading up to the ship’s bridge, where the ceremony took place. The ship’s maiden journey from South Korea to Brunei was under the command of Captain Mateen. 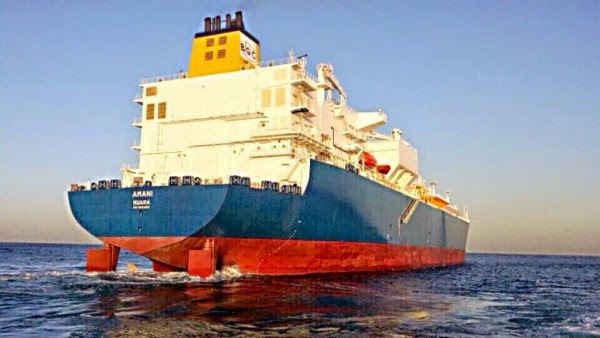 “We hope that the AMANI will be a very reliable and dependable LNG carrier along with her brothers and sisters, ABADI, ARKAT and AMALI as well as the H2607 in delivering cargo to the nation’s customers as their predecessors in the BST LNG Fleet did for close to 50 years,” said the captain. One of the ship’s key features, the Captain highlighted, is its “technologically advanced Gas Transport and Technigaz Mark 3 system”, which he said is “very fuel efficient”. The ship’s Dual Fuel Diesel Electric engine can burn both gas oil and methane, and provides for a more fuel efficient, reliable, cost effective and environmentally shipping solution. The ship is designed to keep its crew comfortable, with features such as a fully-functional gym, a swimming pool and recreational rooms as well as a very well equipped kitchen manned by genuinely talented local chefs. “It’s the first to be filled with Bruneians at every single rank. I’m proud to be part of it,” he added. The Bulletin also spoke with the BGC Managing Director yesterday, who said, “This ship is part of the whole renewal programme of the Brunei LNG ships. We have what we call the B Class ships, which are smaller. The AMANI, an A Class ship, is better designed with more up-to-date technology and from an operating efficiency point of view, it is among the top. It can carry more at lower per-unit cost. “It gives off fewer emissions, and from that aspect it is more environmentally friendly, whereas with the older ships, by design, there are more boil-off losses, for example, and it is a loss both in value and to the environment. Touching on the fact that the ship was delivered from Korea to Brunei by a Bruneian team, he said, “They had to take the delivery of the ship, and whatever processes are involved, in terms of making sure the operating instructions are there, the system works, right from the dockyard and sailing the ship here without any problems, and they have demonstrated that they are capable. “I think it’s a proud moment for them, for the company and for the country because it is a first,” he said. “It is a demonstration that with dedication and focus, Bruneians can do it. I stress to them that it’s down to overall teamwork. The AMANI will be delivering her first cargo to Tongyeong, South Korea from Brunei LNG on December 13.